What Mammals Have Long Noses? Many people are tempted to trim their big noses, undergoing plastic surgery in the pursuit of the perfect nose. Animals don't sweat their looks, so if they're walking around with a huge honker, they don't care. Those long noses usually play an important role in their survival. The tapir is referred to as a "living fossil" because of his prehistoric roots. Related to the primitive horse and rhinoceros, prehistoric tapirs lived in North America, Europe and Southeast Asia, going back 50 million years. This guy's large nose didn't develop until fairly recently; it's only been the last few million years that the tapir's nose grew to its present length. The tapir's nose and upper lip form a trunk he uses to grip, handy for grabbing and cleaning branches and plucking fruit. You can find tapirs in Central and South America, where they live in forests and grasslands, or in Southeast Asia, enjoying life in the swamps and forests of Sumatra and Malaysia. The smallest tapir, the woolly tapir, lives in the Andes Mountains. Despite their long history, all four species of tapirs are threatened or endangered from hunting and habitat loss. The aardvark looks a bit like he couldn't decide who he wanted to look like, with his long, rabbit-like ears and kangaroo-type tail, however this African mammal is known for his prominent snout. He finds all his food through his sense of smell, so his long nose leads the way in his quest for dinner. He also sports a long tongue, which helps him extract termites from their mounds. Though his eyesight is poor, he has great hearing and powerful claws to help him dig for his food. The aardvark is nocturnal, spending afternoons in cool, underground burrows. This guy's nose is so large he's referred to as the proboscis monkey, and he has the largest nose of all primates, growing to about 6.5 inches. The lady monkeys don't seem to be put off by this large schnoz -- scientists believe the large size helps attract mates. The large nose amplifies the male monkey's mating calls, gaining the female's attention and potentially intimidating the competition. If you want to see this monkey in his natural setting, you'll have to go to the jungles of Borneo. He's a great swimmer, preferring to eat seeds, leaves and unripe fruits, with the occasional insect. The proboscis monkey is endangered, threatened by loss of habitat and predators, including humans. 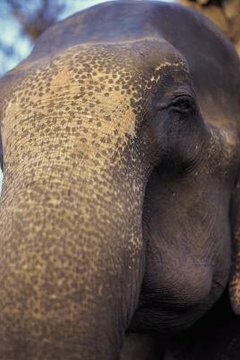 No discussion of long-nosed mammals is complete without the elephant. His nose is his trunk, useful for a variety of tasks. He uses this tool for more than smelling and breathing; he drinks with it, grabs things -- including food -- and trumpets news with it. This boneless organ can weigh 400 pounds on its own and reach up to 7 feet long. With approximately 100,000 muscles and two finger-like appendages at the end, an elephant's trunk can pick up a tiny peanut or hoist a 300-pound log.